A GIANT OF A MAN: Me, I mean. The guy who didn't make the obvious joke. The only time I've been in a recording studio--the kind you see in movies--was about 27 years ago. I was on staff at a magazine called Influence and researching a story about jazz pianist Hagood Hardy. Hardy--best known at the time for an AM-radio hit called "The Homecoming"-- invited me in to watch him record a track on his new jazz album. I remember thinking, "Wow I'm in the studio! This is like writing for Rolling Stone." Hardy--a very generous and interesting guy by the way--was at his piano surrounded by a handful of other musicians. I, on the other side of the glass, sat on a comfortable leather couch. Beside me was a gentleman about my dad's age. I asked why he was there. He pointed to the bass player and said it was his son Richard. I asked if Richard might have been on any records I'd heard. The man said he didn't know but then added, "You've likely heard me." He said his name. "Bob Homme." It sounded familiar, but he then quickly did me the favour of not making me guess. "I was," he said extending his hand, "the Friendly Giant." I had just shaken hands with The Friendly Freaking Giant. On the off chance you have no idea what I'm talking about, I'd have to think an American equivalent would be finding yourself on a couch talking to Captain Kangaroo, in civvies. Or Big Bird. Friendly--star of the children's tv show "The Friendly Giant" was that big. And of course he wasn't. He was shorter than me. But never mind that. I just wish they'd invented Selfies. I would love to have had a record of this event. Everybody my age in Canada--and I'd wager this is one of the few times where "everybody" means everybody--can recall with great detail the measured camera pan of The Friendly Giant show's molasses-paced opening sequence, during which the castle doors swung open, his huge hand reached down out of the top of the TV screen and set out the furniture for his visitors. "One little chair for one of you, and a bigger chair for two more to curl up in, and for someone who likes to rock, a rocking chair in the middle." That's the hand I shook! The one that put all the little furniture in place. 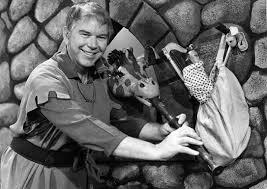 I could go into any bar, retirement home or AA meeting from St. John's to Tofino and find most people in the room of a certain vintage will know Friendly's theme music, the names of the main characters including Rusty the Rooster who lived in a bag hanging off the castle wall and Jerome the genial but goofy giraffe. After the opening sequence, the next 13 minutes were taken up by Friendly telling stories and then jamming with Rusty, Jerome or whatever little critters dropped by. Rusty also had the ability to find huge instruments in his bag that had no right to fit. I don't know how they got in there. In fact, if I didn't know better I'd think this story was about an acid trip. Here's something Friendly told me. The musical sequences? The ones with the guitar-playing squirrel and other talented critters-- were performed by some of Canada's top jazz musicians, including Moe Koffman--who were at the beginning of their careers and looking for quick gigs. I'm telling you all this now because as recently as two days ago, I found myself in the position of explaining the Friendly phenomenon to my daughters Ev and Ria, my son Michel and his fiancee Zoe and listening in was Michel and Zoe's son Mateus, who's eight months but mature enough I think to hear this important information. The older four--all in their early 20s--hadn't known about Friendly but seemed eager to learn. After I whistled the theme song for them and explained the opening sequence, Ev asked, "why would a giant's castle have tiny chairs? Wouldn't it make sense for them to be big?" I thought a moment. She had me. I told her she was right. Sort of shook my world but I didn't let on. Later in the day, I put the same question to my older brother Eddie who was on the Sudbury High School Reach for the Top team and holds a degree in philosophy from Laurentian University. I believe he's a specialist in Kant--and if you knew Eddie you'd realize that his being a Kant expert is such a terrific play on words it qualifies for a blog all its own. To the small-furniture-in-the-giant's-house conundrum, Eddie stood by Friendly. "It made sense to have small furniture because Friendly was having little people in to visit!" All that Laurentian tuition paid off. And these are the kinds of discussions we have in our house. . I must also report that when I realized who I was sitting beside, I did not--repeat not--make a joke about expecting him to be much taller. In fact I think I might put that on my epitaph. "Here lies Peter Carter who, when he met The Friendly Giant, refrained from making the most obvious joke ever." And that's the kind of thing we are proud of in our house. What I'm not so proud of is I waited until today to report this important story. My Hagood Hardy profile turned out fine, but the real story, which I failed to report until now, was my close encounter with the big guy. Reminds me of the young reporter sent out to cover a new soprano's operatic debut but when he returned to the newsroom after the show, he told the boss: "There's no story here. The show didn't happen. Singer committed suicide just before showtime." For the record, I've yet to be called by Rolling Stone.